Above: Visitors check out the Museum of Art&apos;s alcove offerings. Courtesy New Mexico of Art. ON A SWELTERING SUMMER AFTERNOON, I find refuge in a cool upstairs gallery of the New Mexico Museum of Art, on the Santa Fe Plaza. Gilberto Baca, a guard at the museum for 23 years, chats with me in the doorway of the Women’s Board Room gallery. It looks much the way it did when the museum opened its doors in 1917: Decorative vigas span the ceiling; a kiva fireplace nestles in a corner. In the next room, landscapes by early-20th-century painter Cady Wells grace the walls. His confident brushstrokes expertly capture the rhythms of the desert. I lean in to listen to Baca, whose eyes brighten as he recalls one of his favorite museum memories. Admittedly, it is unexpected, given the building’s quintessentially Southwestern surroundings. His story highlights the complex position of an institution that, in many ways, is firmly rooted in the past but has always reached forward and across the globe. This November, the museum celebrates its 100th year of building community and sharing cultures through art. And, just like at its founding, it will do so with style. In 1917, the very idea of a fine art museum in New Mexico was radical. Modernism was just finding its legs on the East Coast. Santa Fe was still a remote town where burros delivered firewood and not a single art gallery bedecked downtown’s just-the-basics retail scene. Nonetheless, several of Santa Fe’s enterprising cultural leaders conspired to attract tourism and boost the local economy by making the city a center for art. As part of this plan, Edgar Lee Hewett, director of the Museum of New Mexico, and Frank Springer, an enterprising local lawyer, campaigned for a new gallery to showcase local art, separate from the Palace of the Governors, which then served as the Museum of New Mexico. They wanted to hit a high “wow” factor and thought iconic architecture could accomplish that. Hewett liked the New Mexico Building designed by Isaac Hamilton Rapp for the Panama-California Exposition of 1915. The soft lines of the building’s Spanish–Pueblo Revival architecture were so admired that it seemed perfect for the new gallery in New Mexico’s capital city. Rapp created a faux-adobe replica, complete with hand-carved details. The aesthetic quickly sparked the “Santa Fe style” that defines the City Different today. Robert Henri, an influential East Coast painter who led the Ashcan School, curated the inaugural exhibition. At his suggestion, Hewett adopted an “open door” policy that invited any artist working in New Mexico to exhibit at the museum. Stop and think about that: a new art gallery in the middle of the desert, open to any artist who wanted to exhibit there? It was a visionary move to establish Santa Fe’s reputation as a haven for artists and art enthusiasts alike. To say that the plan succeeded is an understatement. By 1920, some 80 artists had walked through the open door, including Carlos Vierra, Sheldon Parsons, Gerald Cassidy, Jozef Bakos, Fremont Ellis, and Will Shuster. Artists showed their own work and, sometimes, pieces from their personal collections, filling up a series of alcoves that constitute the main gallery space. They made friends, bought homes, formed the famed Santa Fe Art Colony and Los Cincos Pintores. At one point, renowned modernist Raymond Jonson, founder of Taos’ Transcendental Painting Group, launched and curated the museum’s Modern Wing. 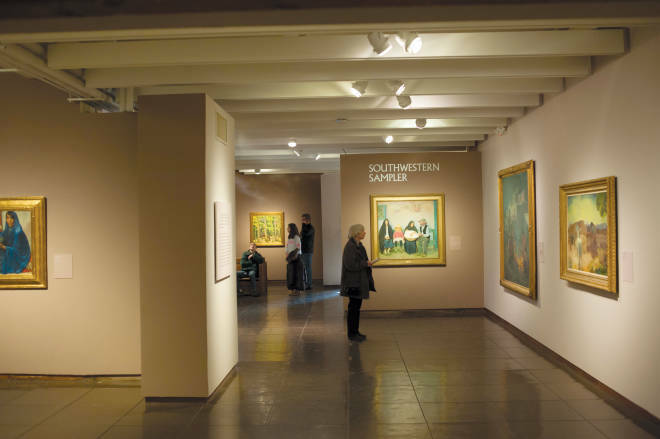 A century later, Santa Fe boasts more than 200 art galleries and museums, hosts major art markets throughout the summer, and is recognized as one of the premier cultural destinations in the nation. The museum continues the alcoves tradition of promoting local artists. A rolling exhibition series spearheaded by Merry Scully, curator of contemporary art, showcases cutting-edge artists working in New Mexico. Lively artist talks draw energetic crowds. On opening nights, Santa Fe’s collectors and creatives pack in to hear the hows and whys of the showcased work. The museum’s contemporary leanings aren’t always apparent, however. A large part of the collection, after all, is made up of early-20th-century art from those first recruits. And, over time, the building itself has been subject to the usual wear and tear, which serves as a reminder of its historic status. Dark floors and limited natural light make the alcoves feel a bit cavernous. It wasn’t always this way, though. For the centennial, she orchestrated an ambitious face-lift to bring back the interior’s original brightness. After a nine-week closure to accomplish the work, visitors will see repainted walls and floors buffed clean of a century’s worth of foot traffic. Architectural details hidden by earlier remodels (like walled-up windows) will reopen to let in light and pay homage to the original design. On November 25, the museum debuts its fresh look and three new exhibitions that highlight don’t-miss works from its impressive collections. A robust roster of events rounds out the celebration. Costumed interpreters dressed as artists from the past will roam the galleries, so you can chat with Georgia O’Keeffe, Laura Gilpin, Will Shuster, Robert Henri, and John Sloan about their work. Catch a tour with a curator for some behind-the-scenes insights. Outside, check out the Wonders on Wheels mobile museum, vintage cars, and lowriders. As the museum moves into its next 100 years, its commitment to contemporary art only grows stronger. Plans are under way to open a second location in the nearby Railyard, dedicated primarily to the art of the new. Consider it just one of the ways that this landmark institution is solidly proclaiming its position as a progressive site for exchange. As I wander through the museum’s renovated interior courtyard, I take in the summer blooms and sculptural fountain, a lush oasis surrounded by vibrant frescoes. Four were painted in 1934 by Will Shuster, one in 1998 by Frederico M. Vigil. I weave through the lobby and duck into St. Francis Auditorium. Overhead, intricately carved corbels flank rough-cut vigas. Paintings by Donald Beauregard, Kenneth Chapman, and Carlos Vierra decorate the walls. A long center aisle stretches toward the stage. The hushed atmosphere feels almost sacred. In fact, the auditorium was modeled after the mission churches at Acoma and San Felipe Pueblos, but for secular events. In 1917, a crowd of 1,200 squeezed into the 450-seat space to celebrate the museum’s grand opening. (If Santa Fe had a fire marshal, he must have joined the party.) Throughout the museum’s decades, people have gathered within it for memorable events—weddings, workshops, dances, and the celebrated Santa Fe Chamber Music Festival. As in 1917, community is key, and the museum’s doors are open. Rallying around a slogan that captures the spirit of their approach, “Contemporary from the beginning,” the New Mexico Museum of Art’s curatorial team opens three exhibitions on November 25 illustrating key concepts as relevant in 1917 as they are now. New Mexico has long served as a hotbed for creativity and exchange. Merry Scully, curator of contemporary art, probes the idea of interaction—among artists, people, and the natural environment—in a sweeping exhibition that brings together work by big-name artists such as Frederick Hammersley, Agnes Martin, Valeska Soarez, Susan York, and Bruce Naumann. Don’t miss Pollination, a large-scale, immersive installation by interdisciplinary art collective Postcommodity and a 10-by-14-foot wall drawing by Sol LeWitt. Wall Drawing #73 comes from the museum’s collections, but may have never been shown before—kind of incredible, given LeWitt’s international renown. Established just three years after the museum’s founding, the photography collection has grown robust and comprehensive. Shifting Light features local greats like Eliot Porter and Laura Gilpin and aims to recontextualize classic photographs. “We really wanted to shake things up and we want people to see something fresh,” says photography curator Kate Ware. Look for an iconic portrait of Georgia O’Keeffe by Alfred Stieglitz paired with a raw self-portrait by Anne Noggle, the museum’s first curator of photography. Questions about identity come to mind as the photographs ask viewers to turn a metaphorical lens on themselves for personal reflection.